You are here: Home / Sports / Everyone is bashing the new Billikens mascot…I actually like it. 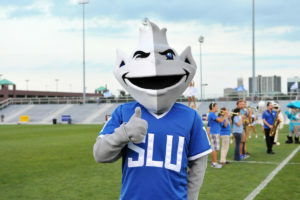 Everyone is bashing the new Billikens mascot…I actually like it. It has kind of a Muppets feel to it. How can you not like the Muppets? 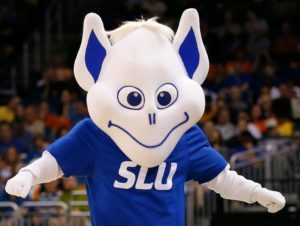 It’s a little edgier, you don’t see the huge honking ears, he doesn’t look like a pushover and still has some of the traditional features of the Billiken. First of all…the Billiken is a mythical character, so it’s totally up for personal intrepretation…it’s a made up character, it’s not like we’re looking at a goofy version of an Eagle or Tiger. However, if you look at this new Billliken, compared to the old one below…THAT THING FREAKS ME OUT! That thing to the right doesn’t look like lucky to me. Imagining walking into a room full of stuffed animals and there’s the old Billiken head right in the middle of cute teddy bears and other furry animals. That’s a nightmare! The old Billiken is crossed eye, has a receding hairline and appears to be toothless with a recessed lip line. If you go even further back to the Billiken of the 80’s…this thing looks like he showed up to a Mascot’s track and field event on Saturday morning after going on an all-night bender and then ended the night at three in the morning with a fight in the alley and now his right eye is swollen shut! So I ask you Billiken fans? Would you rather have, drunk-bar fight Billiken, creep me out stuffed animal Billiken, or the new Billiken? I think the new Billiken is kind of cool!